Philly Cheesesteak Casserole! Need I say more?! 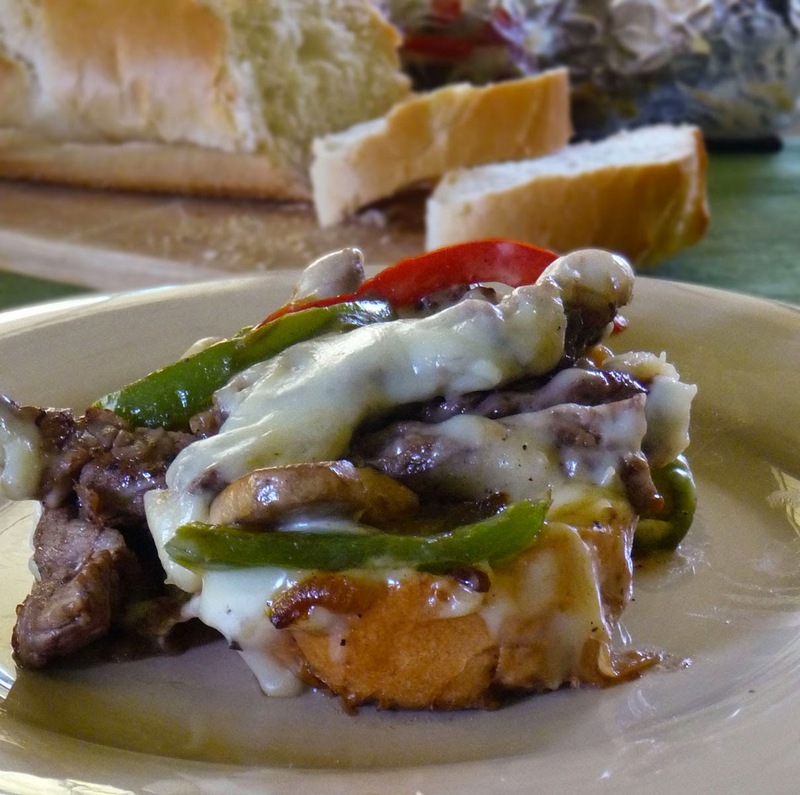 All the goodness of a yummy Philly Cheesesteak in an easy to make casserole! Ribeye steaks were on sale, so I took advantage of that sale and came up with this tasty dinner that is super easy to make. You'll have this on the table in lightning speed and the fam will be beggin' for more! 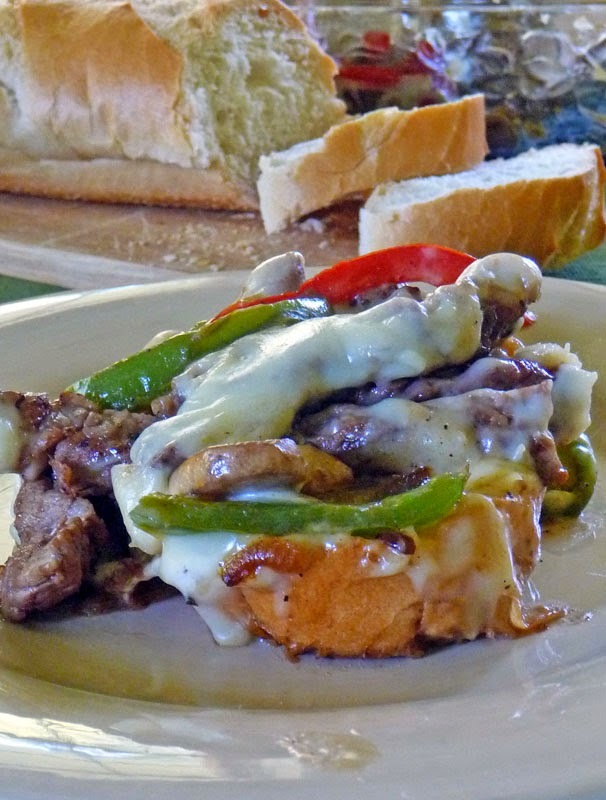 Who can resist the sauteed mushrooms with onions and peppers combined with the pan-seared ribeye and cheeeeese?!! All atop a crispy french baguette with lots of creamilicious, yummy cheese. Did I mention the cheeeese?? It's irresistable! Is it good for you? Nope, it's not healthy at all, but go ahead and indulge once in a while. You only live once!! Make it tasty! Of course, it's not an authentic Philly Cheesesteak! I know better than to make that claim! My mom is from Philly and Philadelphians have every right to be protective of their famous sandwich! 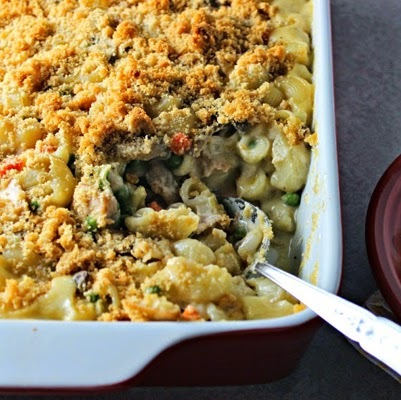 Nothing can compare, but this casserole is still pretty darn tasty, so if you don't have plans to be in the City of Brotherly Love anytime soon, this will do! 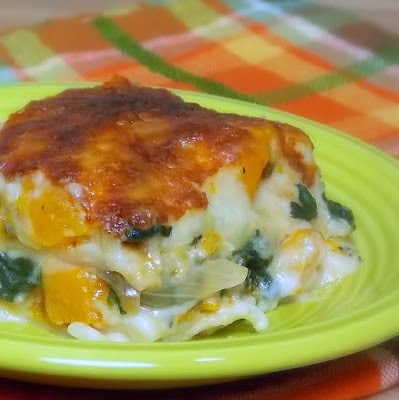 This just might be better than the Meatball Sub Casserole I made recently! Preheat oven to 400 degrees F. Spray a 9" baking dish with cooking spray. Lightly coat one side of each piece of bread (sliced in 1" slices) with the garlic cheese spread (if desired - I definitely desire - yummm), and press bread slices into the bottom of the baking dish. Squeeze as many in as you can. Should be about 6 or 7 pieces, but whatever fits is fine. Top bread slices evenly with 4 slices of american cheese and bake in preheated oven for 5-7 minutes until the cheese is nice and melty. Meanwhile, melt 1 tablespoon butter in a skillet over mid-high heat and add mushrooms and a pinch of salt. Reduce heat to mid-low and cover for about 3-5 minutes until they start to sweat and soften. Add 1/2 thinly sliced red pepper, 1/2 thinly sliced green pepper and a pinch of salt and pepper to the skillet with the mushrooms. Saute, stirring occasionally, until veges are cooked to your liking and most of the liquid is dissolved. I have to have my peppers really soft so this took about 5-7 minutes for me. Top melted cheesy bread with veges and return the skillet to the heat. Melt 1 tablespoon butter in pan and add sliced ribeye. Salt and pepper and cook for about a minute or until done to your liking. I prefer to have the outside browned and still pink throughout as they will be cooking a little more in the oven. Add ribeye on top of the veges and top the whole dish evenly with 4 slices of american cheese. Bake in oven until the cheese is nice and melted, about 5 minutes. Enjoy! 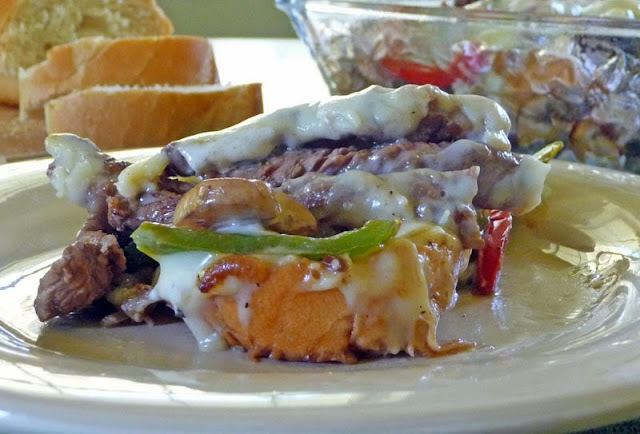 You might want to try my recipe for Slow Cooker Cheese Steaks too! This looks so delicious! Pinning it now! My husband is super picky, but loves philly cheesesteak. Can't wait to try this! When I see a recipe name like this I always read it to my husband for thumbs up or thumbs down before pinning it. This one is getting pinned! 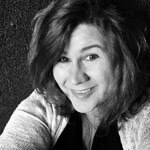 Visiting from Talking Tuesday Over the Fence! This looks so good! Pinning it to save for later. Thanks for sharing at Talking Tuesday! I appreciate it! Marion, I tried a version of these last night for dinner and they were awesome! I shared on G+ and I had previously pinned them. I highly recommend this recipe. Do u put the bread in the pan cheese side up or down? Cheese side up! Thanks for the question! Making this now!! Do you have the nutritional information by any chance? Hi Jesikah, I hope you enjoyed the recipe. I'm sorry, I don't have nutritional info on this recipe. If it helps, there are nutritional calculators available on the web. You can google to find them. I don't use them personally, so I don't have one to recommend and not sure of their accuracy. Thanks for stopping by! 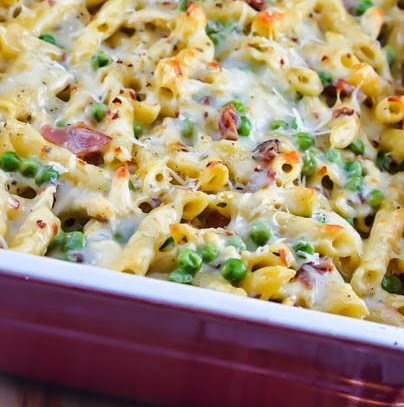 Have you ever tried this as a freezer casserole? Looking for a cheesesteak casserole that I can make and freezer to serve later in the week or month. Thank you!